Astronomers have spotted a strange, obvious and inexplicable black spot near the equator of Jupiter. A picture of the object (below image) was circling this planet electronically this week as researchers scratched their heads about what they'd found. A second image (below), taken on another day by a different photographer, contains a similar looking spot. As of early Thursday, the second image had deepened the mystery. Some astronomers were at first puzzled over whether the two photos show the same thing or not. Researchers said the second image reveals a transit of one of Jupiter's moons across the face of the planet. In the end, the two pictures represent an interesting coincidence. What follows is a story of raw discovery, a behind-the-scenes look at what goes on in the Internet Age when astronomers find something unexpected. Jupiter's complex atmosphere is known to generate ephemeral spots, whirls and cloud formations of various sorts (below image). Many are colorful; often they are bright, sometimes they are dark. This one is particularly dark and larger than many seen in the past. The first picture of the black spot to circulate among astronomers worldwide was taken Oct. 19 by astrophotographer Olivier Meeckers. The image gained wider attention Wednesday as it was mentioned in astronomy newsletters. It had experts captivated. Meeckers, a member of Groupe Astronomie de Spa in Belgium, told SPACE.com he does not know what created the spot. Jean-Luc Dighaye, who founded a European amateur astronomy group called the EurAstro Association, discussed the odd spot with Gino Farroni of the French Astronomical Society and Emmanuel Jehin, a staff astronomer at the European Southern Observatory. 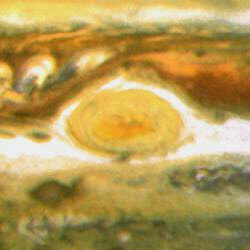 "The black spot, accompanied by at least one plume, can be seen not far away from the Great Red Spot," Dighaye said. 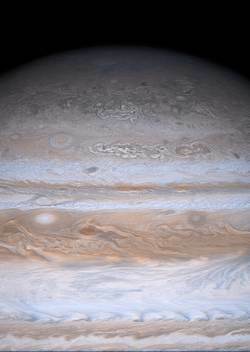 Jupiter's Great Red Spot is a colossal cloud structure, much like an oversized hurricane, that has been raging for at least three centuries. The new spot is an obvious dark circular object below and to the left of the Great Red Spot in Meeckers' images (he took two at separate times on the same day). In an e-mail interview with SPACE.com, Dighaye said the dynamics of Jupiter's atmosphere, with convection and radiation generating strong winds and changing cloud structures, is not well understood. "Spots of various shades depending on the chemical composition of the gases involved in the process are observed from time to time," Dighaye said. "Plumes indicate gas exchanges with the adjacent atmospheric streams which are always fast in the equatorial zones." These streams - which generate Jupiter's characteristic stripes - move at different speeds. It is not known if the spot is purely an atmospheric phenomenon or if it might have been generated by some foreign object, though the latter possibility is doubted. In 1994, impacts of the fragments of Comet Shoemaker-Levy 9 created huge black scars in the Jovian atmosphere. "This time, however, astronomers did not report the presence of any potential nearby impactor," Dighaye said. Jupiter shines by reflected sunlight. Shadows from the four largest Jovian moons can also create spots on the planet's cloudtops. But the astronomers checked the schedules of the moons' passages and, in three independent investigations, ruled them out as the cause of the spot in Meeckers' image. Then a second image emerged, taken by Eric Ng of Hong Kong on Oct. 22. 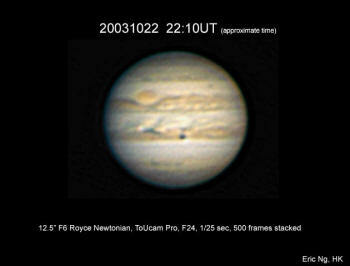 It shows a dark spot on Jupiter in roughly the same location as the strange spot seen by Meeckers. Ng told SPACE.com the spot in his photo is the moon Ganymede, which shows up very dark compared to Jupiter's bright clouds. Dighaye at first considered the situation very unlikely, as the moon's location would be coincidentally superimposed on Meeckers' strange spot. "That's incredible!" Dighaye said of the possibility. But there was more information that apparently hadn't been taken into account. Other astronomers, drawn into the discussion, agreed the spot in Ng's image is Ganymede - not the moon's shadow, but actually the moon itself - perhaps coincidentally positioned over the strange spot imaged by Meeckers. That account came from an e-mail discussion among members of the U.S.-based Association of Lunar and Planetary Observers (ALPO). However, it soon became clear there was another explanation altogether. Because Jupiter's cloud bands move at different rates, Meeckers' spot had rotated to a new location, and apparently morphed into a less noticeable shape and shade, by the time Ng took his picture three days later, according to Geoff Gaherty of the Royal Astronomical Society of Canada. Gaherty was alerted to the apparent similarity between the images when he read the initial version of this story. Ng, re-interviewed, agreed with Gaherty's explanation. That still leaves the original strange spot, the one found by Meeckers, unexplained. 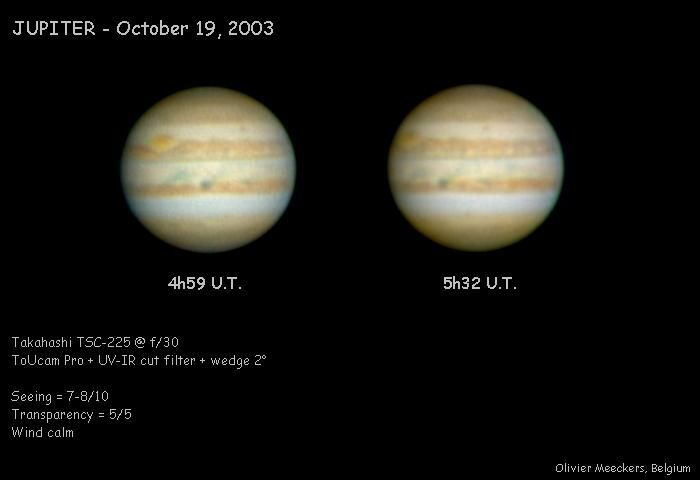 Another well seasoned Jupiter observer weighed in late Thursday, suggesting that dark spots in the Jovian clouds are not as rare as some astronomers think. Nonetheless, scientists know little about what causes the spots. Meanwhile, observers are working with a narrow window of time each day to learn more about the unexplained spot. 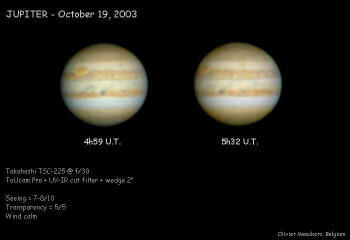 Jupiter rises in the East at around 3:30 a.m. local time and is high in the sky at daybreak. But since it rotates, the hemisphere with the new and perhaps fading spot is not always facing Earth. "It would be exciting to follow the evolution of this new black spot -- probably still visible in modest astronomical instruments -- from many locations of various longitudes on Earth, so that some observers are always favorably positioned when the Jovian hemisphere of interest comes into sight," Dighaye said. Jupiter is visible to the naked eye. It appears as a very bright star in the predawn eastern sky. In fact it is brighter than all stars and cannot be mistaken. Binoculars or small telescopes can reveal up to four points of light near the giant planet. These are the Galilean moons. A modest telescope -- about 4-inches -- will reveal the major cloud bands of Jupiter. In general, larger amateur telescopes are needed to show smaller features like the newfound, unexplained black spot.